A crowd turned out at Spaso House on Sept. 18 to welcome America’s new top diplomat back to the Russian capital. In contrast to the numerous op-eds and articles that appeared when John Tefft was first mentioned as the next U.S. Ambassador to Russia, his arrival in the Russian capital has barely warranted a comment. Tefft, who was nominated in June and confirmed by the Senate on July 31, landed in Moscow a few days after being sworn in by U.S. Secretary of State John Kerry on Sept. 2. The new ambassador has kept a low profile during his first days in Moscow, unlike his predecessor, Michael McFaul, who was the subject of a report on Russia’s First Channel television station just days into his tenure. Tefft’s first public appearance came on Sept. 17, when he opened the AmFest festival of American film. And the following evening, Tefft and his wife Mariella hosted their first reception at Spaso House, the ambassador’s residence. The event was well attended by members of both the Russian and foreign press as well as notable business figures, including Mikhail Prokhorov. Government representatives, however, were mostly absent. 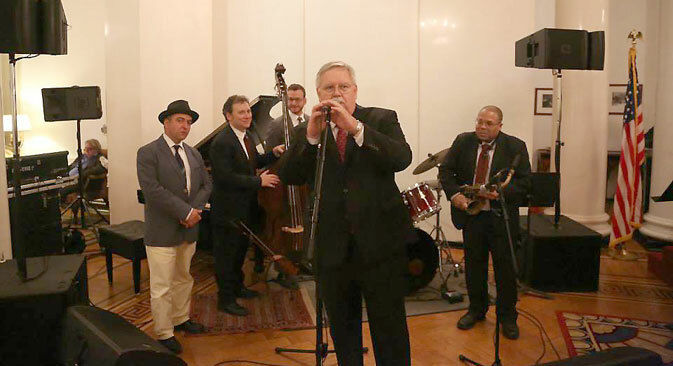 Tefft, who served as the deputy chief of mission in Moscow from 1996-1999 and subsequently served as U.S. ambassador to Lithuania, Georgia and Ukraine, speaks Russian, but at the reception he gave only a brief greeting, relying on a translator to relay the rest of his remarks. Tefft, unlike his predecessor, is a professional diplomat and is expected to be more cautious in his dealings with the press and the public at large. At his inaugural reception, however, Tefft himself was approachable and appeared happy to engage with attendees. In a comment for Kommersant FM, columnist Konstantin Von Eggert, who attended the event, said that Tefft did not come off as the “nuisance for the Kremlin,” that many Russian commentators had expected. After presenting his credentials to Russian Deputy Foreign Minister Sergei Ryabkov on Sept. 8, Tefft issued a statement outlining his views on his new position. “As Ambassador, I have two main responsibilities. First and foremost, I am here to promote, defend, and explain the interests of the United States. Secondly, I am here to help my own government understand Russia’s goals and perspectives. Ryabkov, for his part, noted in an interview with RIA Novosti after the meeting that he had known Tefft a long time and looked forward to a productive working relationship with him. “He was very insightful, professional and responsible. I would say he is a true diplomat. It is still too early for us to say what his arrival in Moscow means. Very little time has passed. Yet, according to my first impressions, I think that we can get down to business, and we would like to think that it will be precisely so," Ryabkov said. Yevgeny Minchenko, director of the International Institute of Political Expertise and a professor at the Moscow State University (MSU) is not as optimistic about Tefft’s chances of improving U.S.-Russia relations. “The reset has finished and it would be naïve to expect any type of warming before the end of Barack Obama's presidential term,” Minchenko told Russian news agency Regnum. He added, though, that those who expected Tefft to try to instigate a “color revolution” in Russia should rethink their assessment of the ambassador. Russian whataboutism vs. U.S. moralism: Is attack the best form of defense? “Talk about Tefft coming and organizing a color revolution in Russia is mere nonsense. Color revolutions are organized where there are foundations for them, where society is charged. McFaul was also expected to do something wicked, but nothing bad really happened," Minchenko said. Tefft’s job, according to Von Eggert, is rather to convince the Russian authorities that the U.S. is serious about using its influence to damage the Russian economy and the country’s standing in the world. Reporting from Kommersant, Regnum and RIA Novosti was used in this story.